Whether it’s to recognize a colleague or for a friend who has been there through the thick and thin, sometimes a thank you needs a little bit more. A Clear Acrylic Desk Block is something that will suit just about anyone. And, each name plate can feature a special engraved message for your special someone. 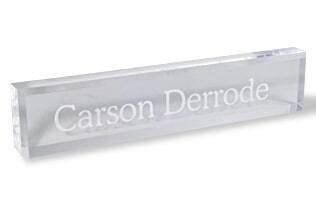 PRICE INCLUDES: One Clear Acrylic Desk Block with one or two lines of engraving. Shipping costs will be displayed in the shopping cart.